Traveling to Rio de Janeiro from the Pantanal was a bit like hopping out of Never, Neverland and back into reality. Rio is a vibrant, lively big city, known for it’s beach culture and carnival. The Pantanal is known for it’s birds, quiet and swamp like atmosphere. Traveling between the two was like traveling from one end of the spectrum to the other. One night in Rio, and we were enraptured. It was as though we returned to Never, Neverland, just this time in a city built in paradise. We showed up with now plans but quickly found a Rio de Janeiro hotel and immediately started to fall in love with all things Rio. At the corner of our street a juice bar seemingly ran all night, squeezing fresh orange and citrus juices from an industrial sized blender, with bags of fruit swinging from the ceiling rafters. The music played loudly and the crowd kept coming. The people were as diverse as the juices the shop blended. Of all ethnic groups, backgrounds and cultures they converged on this tiny juice stall. The men gathered at the counter, the couples at sidewalk tables. It was as though no other place in the neighborhood existed. And yet every 10 feet there was another place just like it – a gathering place for a seemingly endless neighborhood of friends. From our base in Catete we explored Rio on foot, by bus and by metro. We walked the famous beaches, wearing more clothing than seemed appropriate, and covered more distance in just a few days than we ever thought possible. Ipanema, Copacabana, Leblon, it seemed hardly real to be at an exotic beach one moment and in a busy, thriving metropolis in the next. We skipped the climb to Christ the Redeemer and Sugarloaf, opting instead to explore the picturesque architecture of Santa Teresa. What was old was also new in Rio de Janiero and the colonial architecture mixed with skyscrapers, creating a landscape that was the antithesis of planned, and at the same time, fit together like an old puzzle. 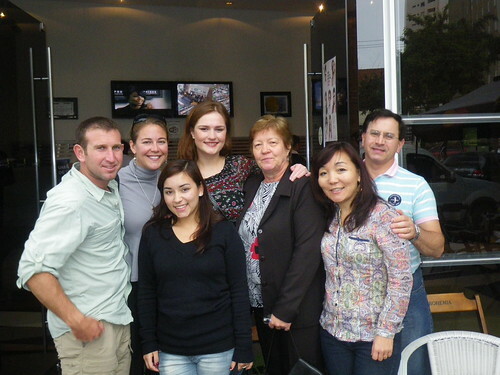 We met, dined and enjoyed the evening with local students. Unwilling to break the spell that Rio and it’s residents held over us, we talked politics, life and philosophy (as you do when you’re enthralled with a place!) until the wee hours of the morning. And when we returned, the juice bar was still open. 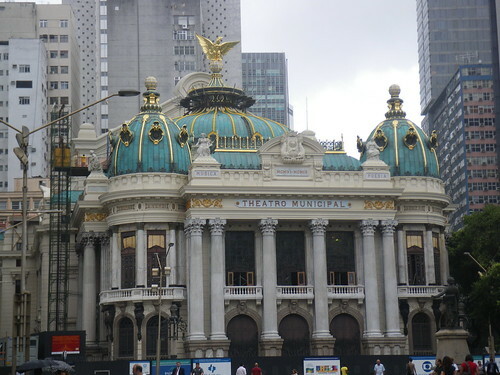 IF YOU GO: Although Rio de Janeiro is full of interesting neighborhoods with their own character, and a hotel in Rio de Janeiro always seems to be well located- between the bus, metro, taxis and on foot, nothing is a long distance away. It is easy to fall in love with Rio and fall under it’s spell. Take the time to explore beyond the beach and the Sambadome, there is so much more to the city than Carnival and tiny bikinis! Sure, yesterday was thanksgiving and we made it back to the States in time to celebrate but featuring turkey just doesn’t seem right to us, given that it is virtually impossible to find anywhere south of the border. Instead, in honor of Turkey Day, we figured we’d offer our readers a taste of another USA treat. One we know and love that just hasn’t been the same south of the border: the hot dog. There is an expression sometimes uttered in Washington, that the two things you never want to see made: sausages and laws. I don’t disagree. So we’ll skip the creation process of these encased little snacks and instead focus on the different varieties we’ve tasted. Guatemala– the rather tasteless cheveres scared us a bit and we generally shied away. Only available after dark on the street they always smelled a bit foul and the fixins were never particularly appetizing. Colombia– we had our first taste of the South American version of the hot dog, where it was actually called a perrito caliente (little hot dog). It was smothered in smashed up plantain or potato chips, doused with an army of sauces and covered with onions. The chips were really what separated it from the NYC variety, that and that in Colombia the one we had was microwaved instead of flame cooked or boiled in water. Brazil– I don’t remember what they called it, but we ate it at a stand in Cuiaba. 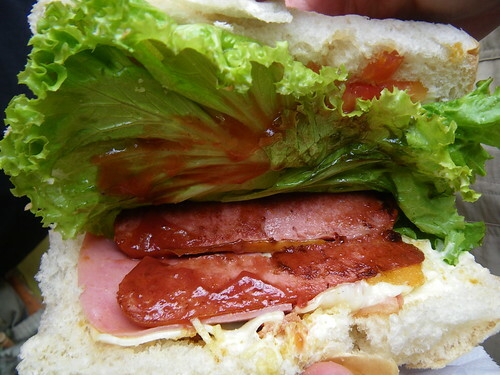 It was on a toasted bun with cheese, ham, hot dog, lettuce, ketchup, mayo, crunchie fries and tomato. It was by far the greasiest piece of meat we’ve eaten in our entire lives. We felt sick afterwards. 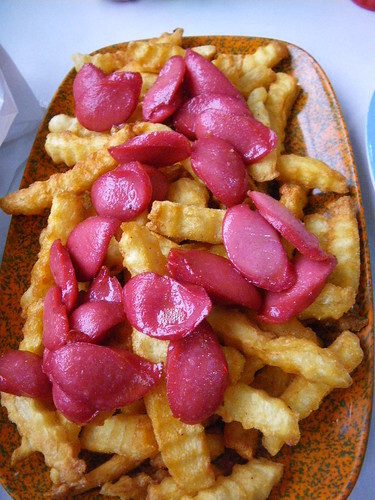 Bolivia– Instead of just a hot dog, Bolivia is a fan of salchipapas (also common in Peru), cut up hot dog on french fries. The hot dog isn’t the highlight, but with all that grease on one plate, it can’t taste bad. Plus, they always had ketchup. Yum. 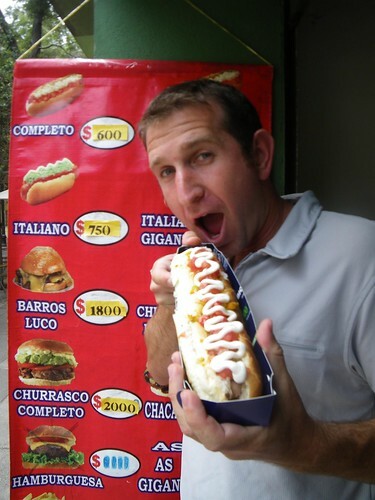 Argentina- had in my opinion, the most fun with the hot dog called a Super Pancho. 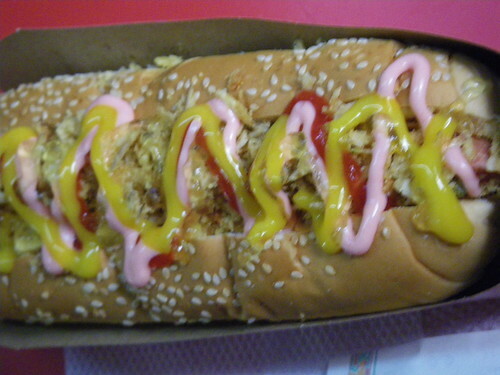 In these the dog was usually about a foot long, if not longer, and didn’t come close to fitting inside the bun. The number of sauces piled on top (ketchup, mustard, mayo, golf sauce) is rather unsettling and these are almost never sold in street side stands and instead are sold in small Super Pancho shops. The best part is that like Colombia and Brazil, crunchy potato sticks are put all over the top. Chile- very similar to Argentina except that the sauces we tried were all… unsettling. 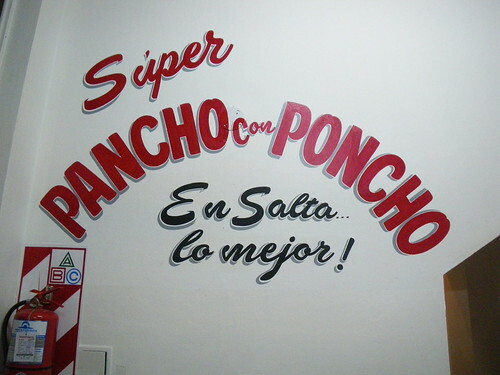 Also called a pancho, and the one we tried in Santiago, well we did have video, but trust us you wouldn’t want to see it. In truth though, nothing comes close to a good Sabrett or Hebrew National dog from a NYC vendor, covered in ketchup (a rarity anywhere but the USA) mustard, onions, relish, and maybe some onions and if you’re really lucky some chili sauce. 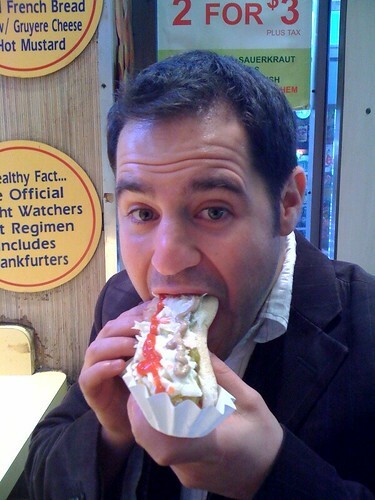 In fact, just thinking about the late night dogs we used to get in college from Manouch has me salivating. Washington, D.C.’s specialty is the half-smoke, a plump and short spicy beef dog served on a plain bun or better yet at Ben’s served smothered in chili. Since we haven’t been up to New York (or even Washington, DC) in awhile we had to ask a friend to fine one to enjoy for us…it wasn’t too difficult to convince him to do it though. I first heard of Mate traveling in Guatemala on my semester abroad from college. I didn’t try it but I did remember it and when I saw it again, and had the opportunity again, chose not to try it again. I figured that since I was going to Brazil, Argentina, and Chile I should wait to try it in one of those countries. Mate itself is basically a type of herbal tea (sort of looks like oregano or crushed tea leaves) that is very popular down here. Rather than filling a coffee mug with water and dropping in a small filter bag with tea leaves inside, with Mate the cup itself is special. No ordinary mug will do. The mate cup (actually just called a Mate) is actually a hollowed out gourd. Since the inside is an organic material (the outside is often decorated) that soaks up the flavors of your Mate overtime so the gourd collects more flavor. Sort of like a caste iron skillet. To drink mate you also need a special metal straw enclosed on the bottom with a strainer. The entire mate (gourd) is filled up with the yerba mate, what we in the north would call the tea leaf. Since there is no filter bag, the straw has to do the filtering. To drink, you fill the gourd with hot water (often kept in a thermos), a little bit of sugar and sip it down, adding more water only when you want to drink it. This however does take some practice as drinking hot water through a straw is not exactly the best of ideas…and that’s forgetting the fact that this is a metal straw. Whatever you do, don’t jiggle the straw…metal doesn’t exactly make the best filter and that can make it so some leaves come on down your throat. 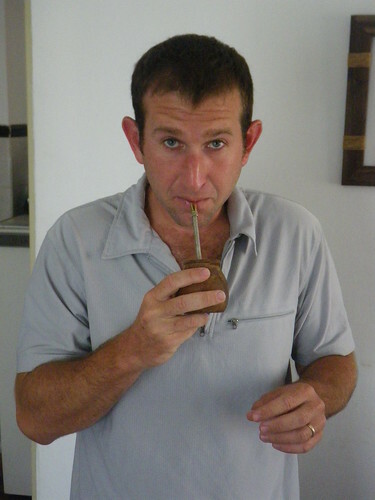 Mate is a social beverage and often the mate gourd is shared among friends. One person finished the “tea”, fills it with more water and passes the gourd to another person. Like an herbal tea, mate has a bitter taste and often people add a little bit of sugar to the mixture to soften the flavor. Mate is often referred to as a stimulant, and its use is similar to that of coca leaves in northern andean countries. If you can find it in the US I highly recommend trying it! Leiderhosen, accordions and beirgartens. 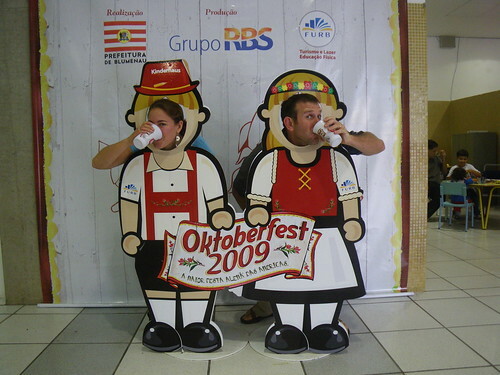 Welcome to Blumenau, Brazil home to the largest Oktoberfest party in the America’s. Stepping through the gates, the entire place was decorated like a little German village complete with gingerbread men. Brazilian bands played German music on three stages, and there were more beer booths than I’ve ever seen before. Although I grew up in Pennsylvania, a state with German heritage, it was my first Oktoberfest. 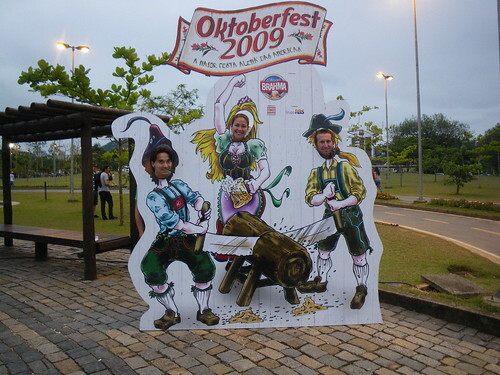 I expected the beer, the music and the outfits, but I didn’t expect Brazil’s Oktoberfest to lack “Brazil”. Not even a note of samba music (though it looked like some people were trying to dance samba to the German music), and no samba style outfits, or Brazilian bar-b-que. The food was in fact pretty German. The X-Alamao (pronounced cheeez alemou), a mix of meats, onions and peppers was delicious and quelled our dancing hunger. Plenty of mustards and even a hot sauce or two. The only thing missing were pretzels, which were no where to be found much to my Pennsylvanian chagrin. The only thing to do at Oktoberfest is to drink, so of course dove right in, ordering two rounds of local beer before braving the dance floor. Liquid courage I believe its called. 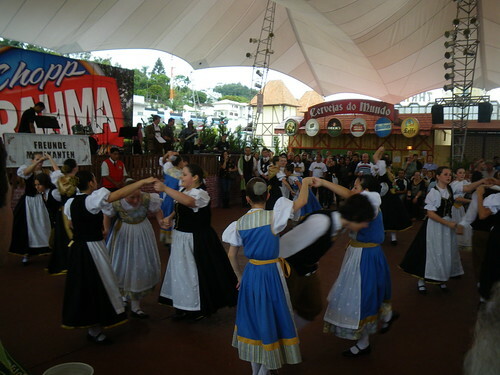 Surrounded by a German dance troupe in traditional costumes, we attempted a German folk dance, sung in Portuguese, which resulted in complete confusion on our end. So it was our first Oktoberfest, but certainly not our last. Hopefully the next one will be in Germany! Wanna see more Oktoberfest pictures? Check out our flickr page. We travel for the places, but the people are what make the places. You go somewhere and you meet certain people, have certain experiences and no matter how many times you go back to that same place, it will never feel the same again. Think about your travels, the people are the memories you have, not the actual places. It’s the same for us, no matter where we are its the people that make the best memories. Last week we had a very unique opportunity to couchsurf with some travel buddies who stayed with us last year. In fact, they were the in Danny’s very first blog post. We did things that normal travelers don’t get to do like share in family meals and road trip to Oktoberfest, but we also got to hang out with our friends and have some down time. 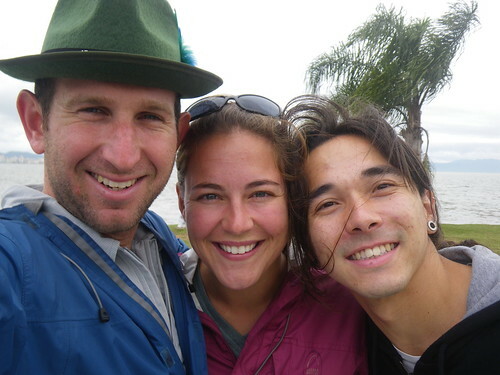 I’ll fully admit, without spending time with them Curitiba and Florianopolis would not have made our must-do list. Beyond not having to stay in a boring hotel or hostel (they all seem to blend together after a while, truly), its nice not to always have to introduce yourself and share your story. Sitting around the dinner table laughing at jokes translated into three languages, we really felt like we were in our own home back in our pre-travel life. I’m not going to lie, it made me miss that life a lot, but if we hadn’t chosen to do this trip we would never have meet these people or gone to these places.